Photos of babies in different emotions and facial expressions melt our hearts as adults. These photos are usually taken with so much effort. It brings out our desire to become a parent and take care of these babies someday. They are just too cute to resist. 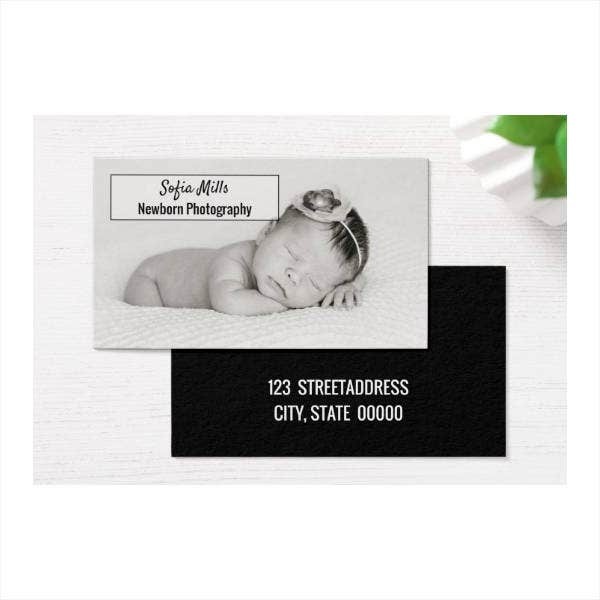 You may also see professional photographer business cards. Babies have always been an amusing subject for photographers. The wide range of pure, innocent emotions being shown by these cuties has the power to uplift us from a bad day. 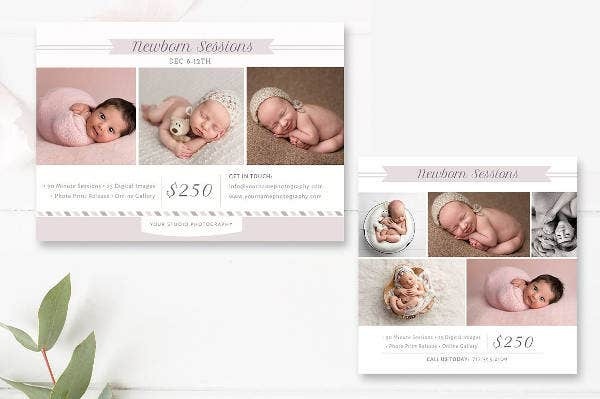 Newborn photographers are hired to photograph newborn babies. They have business cards to certify their job description. 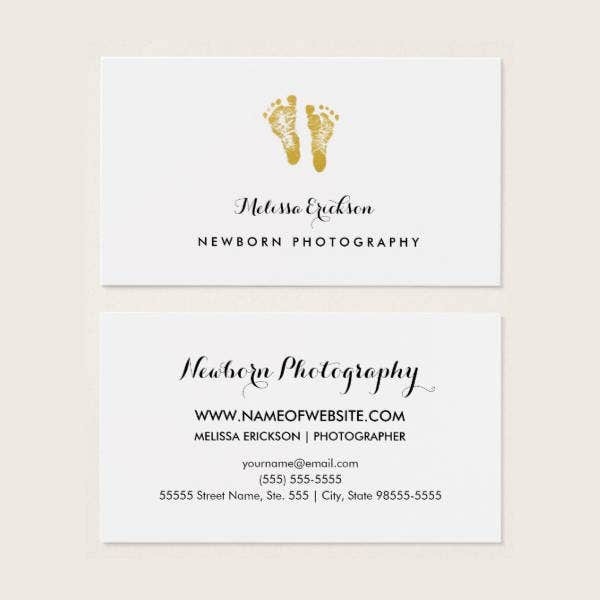 If you are a photographer of newborn babies and you don’t have a business card, check out our template collection. You have to do everything when you want to make your own design for your business card. The standard size of a business card is 3.5 inches by 2 inches. Within that little dimension, you should be able to come up with a decent design for your card. 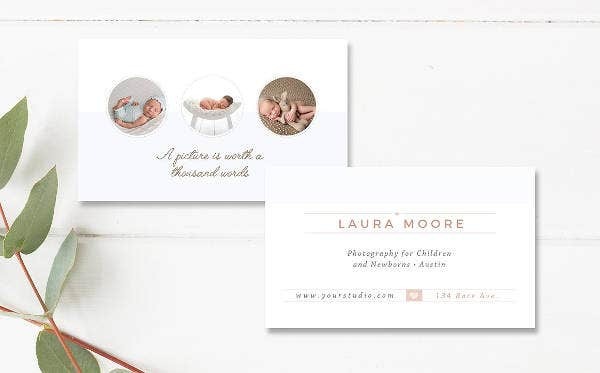 Newborn photographer business cards are minimal in design. It has a photo of the baby either in the middle or at the side of the card. This gives proper context about the photographer being a skilled one in taking baby photos. As much as possible, take a simple approach in designing the postcard. 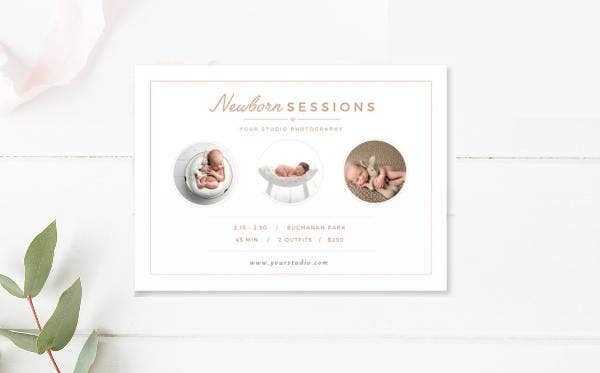 It may be about the baby, but it’s also your branding as a photographer. Take a good shot of the angle of the baby and use the photo. Put some small details to decorate your card. Keep the details to a minimum so it won’t overlap with the photo of the baby. Put in basic information. If you are working for a company, put its name and address. Next, put your name and contact details. Write your mobile phone number, email, and social media accounts in the front part of the design. Make sure all the fonts are readable. Always save your work every now and then. Make some finishing touches on the design before preparing it for printing. Taking a picture of a newborn child can be quite tedious. Babies are unpredictable. They are asleep at the moment and crying on the next. Parents need to push them down as these little cuties don’t know that they are being photographed. As a photographer, you also have to be patient on the quirks of a little child that’s just too cute to resist. Always have your camera ready at all times. 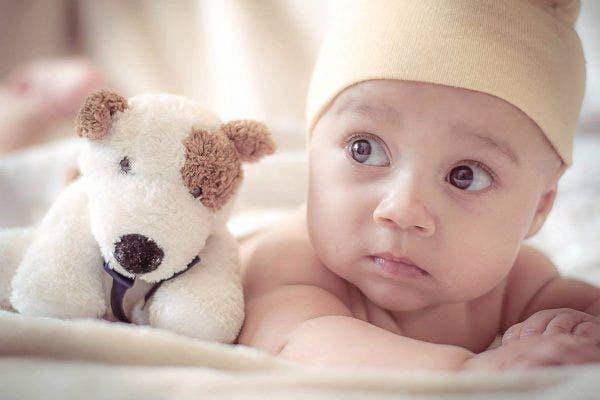 Taking a photograph of a newborn child can be accomplished with these tips. You may also see studio business cards. 1. Identify the purpose of the shoot. Some parents want to have a photoshoot starring their newborn babies so they can use it for baby announcements. Some want to keep it as a memento before their child grows up. Talk to the parent about the purpose of the photoshoot so you can begin planning. It is cute to have a concept with the baby photoshoot. Most parents want it to be intimate. Some come up with a superhero concept or a more-nature oriented theme. For the baby’s safety, most photoshoots are done inside the bedroom. When you have decided on a concept, you can now prepare everything for the photoshoot. You may also see media business cards. 3. Prepare the important stuff. The amount of props you need depends on the concept that you came up with. For example, if you want a photoshoot in the bedroom, you should prepare everything from the bed, clothing of the baby, blankets and every single thing to keep the baby warm. Also, prepare some backup cloth in case the child pees or defecates in the middle of the shoot. You may also see unique business cards. 4. Set the baby’s mood. This is more of the parent’s job than yours, but you can also help in setting the baby’s mood. Keep the baby happy and the photoshoot would go well. You wouldn’t know what would happen next and how the baby would react in the slightest of touch. You may also see business card designs. 5. Keep the baby safe. Talk to the parent about the baby’s safety as you start the photoshoot. Make sure that the props are safe for him to use and he would not have a hard time being photographed. Make sure the cloths being wrapped around him will not irritate his skin. No matter what angle it is, think of the baby’s safety first. You may also see elegant business cards. Lighting is one of the aspects of a great photoshoot. It does wonders in highlighting a baby’s facial expression and the overall photo as well. It can make or break your photo. Natural light such as the sunlight can help you in capturing a great photo of the baby. Remember that it is everything in a photoshoot. You may also see folded business cards. 7. Capture the tiniest details. Details such as the nose, eyes, lips, eyebrows, and cheeks must be captured well. These change drastically as the child grows up and you will surely want the parents to have that kind of memory of their children, a memory they can cherish again and again. As a photographer, you also have to capture their raw emotions. You cannot tell a newborn to smile for the camera. You must know when to capture the baby’s emotions. The baby is at his best when he is sleeping. Many kinds of photos at all angles can be taken from that. The awkwardness, purity, and cuteness of their emotions are too cute to handle. Sometimes, it is the tiniest details that tell the biggest of stories. You may also see vintage style business cards. 8. Experiment with perspectives and other angles. Taking photos only using one angle can make your photos very boring. You have to learn and experiment in taking photos at different angles. It shows the baby’s wide range of emotions. There’s a lot of room for experiment with camera angles. The different perspectives of taking newborn photos do their own magic as well. It brings more focus to the baby and less on his background. You may also see creative square business cards. Sometimes, the studio is not the only option for a newborn photoshoot. Going out and getting immersed into the nature is also a good option. You can go for a beach photoshoot for the baby, or in a forest. Parents should be careful in these kind of shoots. It is about the baby and he should be kept safe at all times. You may also see business card templates. 10. Include the other siblings and the parents. To add variety in your photo shoot, you must also include the older siblings and the parents. Their jobs would be to hold the baby in the shoot and do much of the smiling part. It is heartwarming to see them as a family in a photo that celebrates the arrival of the family’s newest member. You may also see artistic business cards. 11. Keep a positive thought. It is a huge challenge to photograph newborn babies. They can cry after being calm for a few minutes or want to be fed. Keep in mind that patience is the key to do the job well and you must coordinate well with the parent all the time. There’s no need to worry since the parents are there. 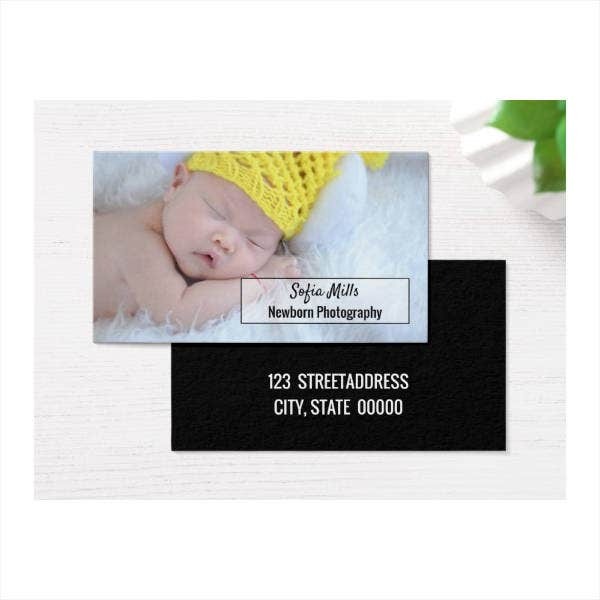 You may also see business card template designs. Select from the photos that you took together with the parent. Half of the decision of the photos to be printed out should come from the parent. 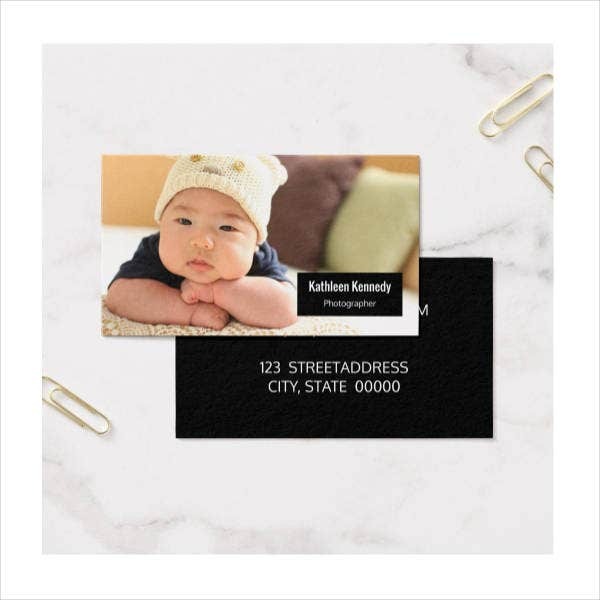 These adorable snapshots last a lifetime when they are printed and given as keepsake. You would often begin to wonder how this child will grow up and what kind of person he would be. You may also see cool business cards. Taking photographs of newborn babies is amazing and heartwarming. You get to see innocence in its rawest form. These cute little angels bring peace even in our most troubled mindset. It is more than just for baby announcement purposes. These are memories that are meant to be preserved forever. You may also see black business cards.